SPICIAL OFFER. MARCH WEEKENDS ARE 25% DISCOUNT. ENJOY SOME GREAT SPING SKIING.Ellicottville is located in the Enchanted Mountains of Western New York. This home is in the village, within walking distance of restaurants, bars, grocery stores and numerous quaint shops and boutiques. It is only a half mile to Holimont Ski Area,or Holiday Valley Four Seasons Resort. Golf, cross country skiing, mountain biking, hiking, fishing, antique stores, fall foliage, Allegheny State Park, and a Seneca Nation casino are within 10 miles. We sleep 8 people. There are 2 bedrooms with queen beds. The 3rd. bedroom has 2 single beds, which also can be made into a king bed if you wish.. Also in the living room are 2 sofas, one converts into a queen. All bedrooms have a T.V. & are air conditioned in the summer. Fully equipped kitchen, gas grill on the back deck. All towels & linen are provided. 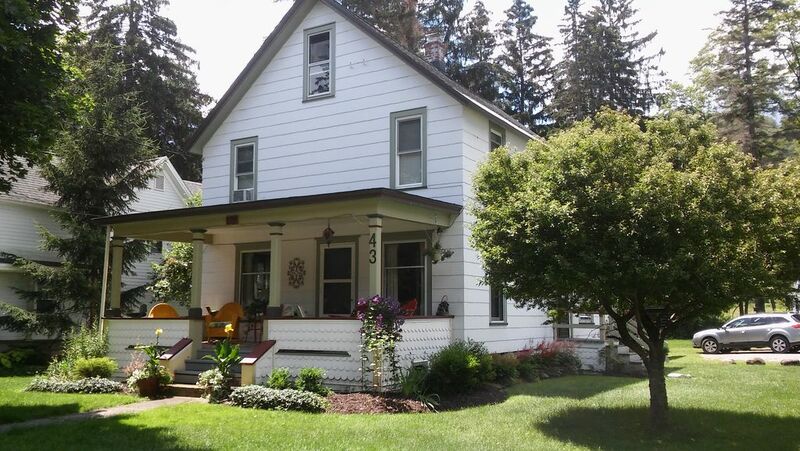 Watch the world go by from the comfy front porch or enjoy the peacefull yard from the covered back deck. This is fun house for family gatherings, weddings, golf or ski vacations, mountain bike events or any of the special event weekends. We are owner/operated, no rental management company to deal with. We live on the property, in a separate carriage house, if you should need anything or information while you are visiting town. If you would like to contact us or book a stay, you may email, using this website. We are inspected yearly by the Village of Ellicottville & approved for short term rentals. Please note; Summer rates are based on 2 night stay. If we do a 1 night stay, add $30 on weekdays & $65 on weekends. Walk to all the restaurants,bars & shops in The village. Less than 1 mile to Holiday Valley 4 Seasons Resort or Holimont Ski area. Walk to all the shops, bars & restaurants in the village. Very clean and well stocked. Comfortable place within a five minute walk to the bars and restaurants. Perfect place to kick back, perfect location! We stayed here for a ski weekend and the property was awesome. Older home that has been very well kept and updated! Steve was great and polite and had everything ready for us and was very easy to get ahold of prior to and during our stay. Would HIGHLY recommend this property to anyone. Will definitely be staying here again! Excellent location and awesome place. Has all the amenities you can ask for. Lots of space. Owner was extremely helpful. Highly recommend staying there. Convenience to town was most important. Getting key from owner Steve was easy and kind. He kept a very tidy, charming home! The kitchen is great! We enjoy cooking and hanging out at table and this kitchen was perfect. Six of us stayed comfortably but having two bathrooms, more than 6 might be a stretch. Music fest weekend was a blast in Ellicottville. Another fun, safe and superb weekend for the gathering of great friends. Awesome house in a great location. Steve is a wonderful host. We will definitely be back! Great place for a ski weekend! This is the perfect house for a ski weekend in Ellicottville. Easy access to the slopes and walking distances to restaurants downtown. Very clean inside and out and will definitely be back! The owner is very accommodating and is happy to answer any questions you may have. summer rates are based on 2 night stays. Add $50/ night for 1 night . All fees included for all rates.PLEASE NOTE. Weekend(holiday) rates apply during Christmas Week.